The New Moon in Cancer on June 24, 2017, was opposite 330836 Orius, a centaur discovered in 2009 at Baldone observatory in Latvia. The orbital period of Orius is almost 100 years, and the orbit crosses those of Uranus and Neptune. The naming took place in 2013. In Greek mythology Orius was one of the centaurs killed by Heracles in the battle at Pholus’s cave. Heracles had asked Pholus to open a jar of wine, which was a shared property of all the centaurs. What do the examples below have in common? The words disobedience and resistance came first into my mind. The Hells Angels Motorcycle Club was started on March 17, 1948, in Fontana, CA. 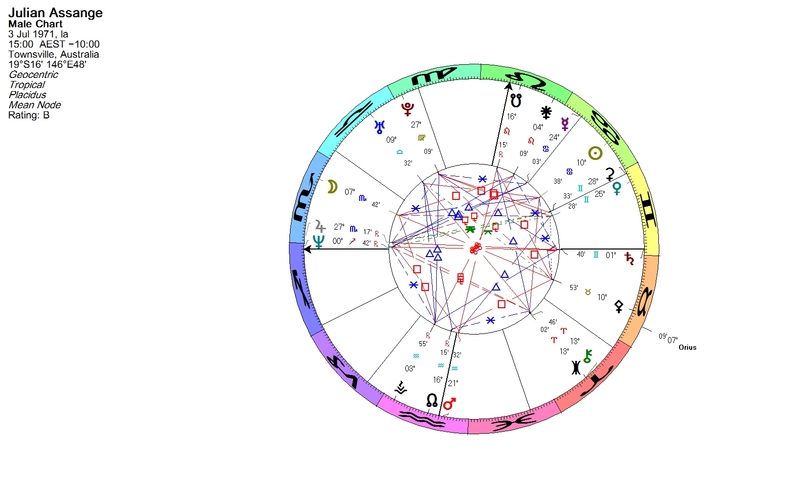 In the chart there is a Sun-Orius conjunction in Pisces. The club is considered an organized crime syndicate, though it fights to present a more benign image to the public. They even organize charity events. In 1966 the organization was registered as a corporation, which aimed to improve motorcycling and traffic safety. Hells Angels played a part in the counterculture movement of the 60’s in San Francisco. Wikileaks website was launched on Oct. 4, 2006. 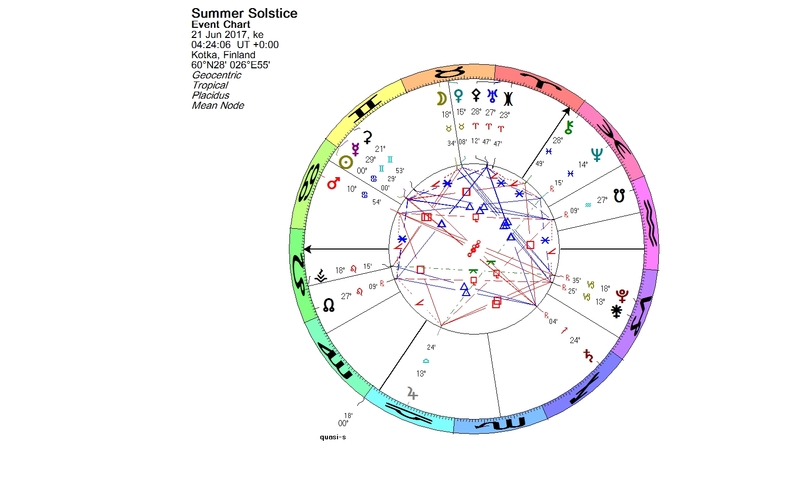 The Sun-Orius conjunction is in Libra. Wikileaks is a media organization, the goal of which is to bring important news and information, provided by anonymous sources, to the public. The chart data is from Planet Waves site. The founder of Wikileaks, Julian Assange, has been demonized as a criminal or terrorist by various governments. 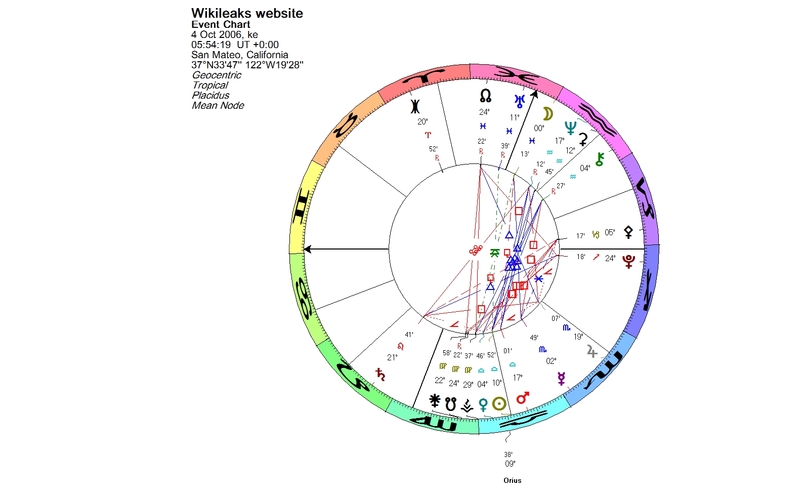 Julian Assange (born July 3, 1971, in Townsville, Australia) has Orius in Taurus opposite his Moon and in conjunction with Pallas, the asteroid named after the Warrior Queen, and symbolizing political activism. Greenpeace, the environmental organization, originates from The Don’t Make a Wave Committee, which was formed in Canada in 1969. On May 4, 1972, the group officially changed its name to the “Greenpeace Foundation”. At the time the Sun-Orius conjunction was in Taurus, Jupiter in trine to Orius. 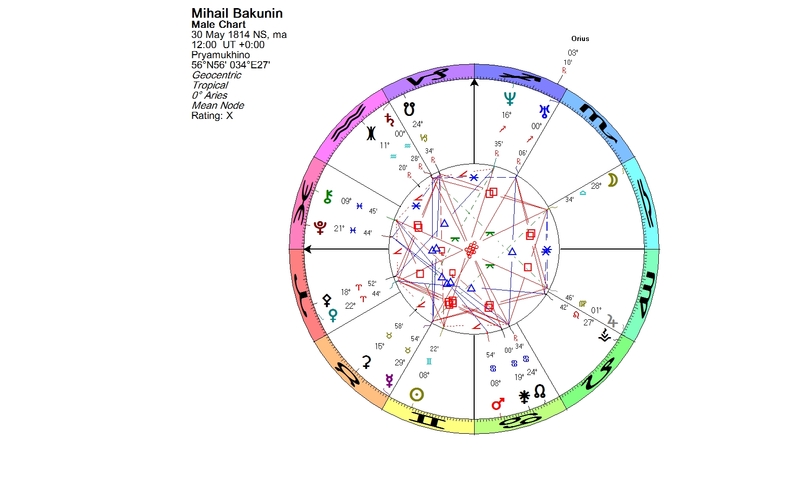 Mikhail Bakunin (born May 30, 1814, in Pryamukhino, Russian Empire), is considered among the most influential figures of anarchism. 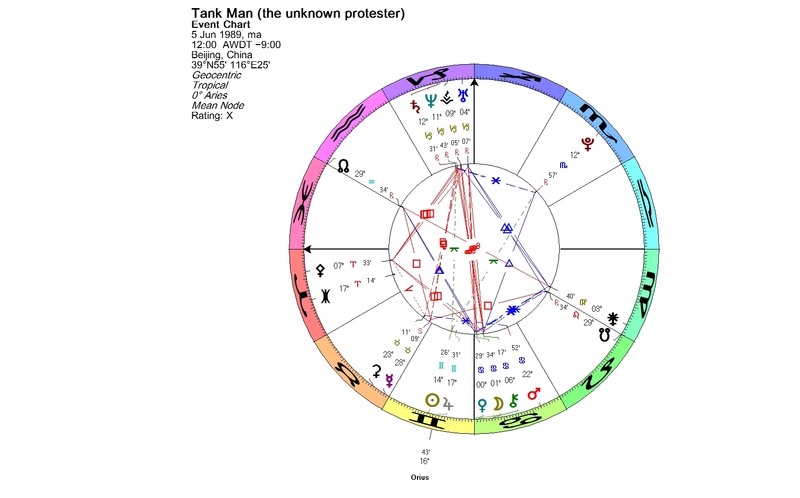 His Gemini Sun opposes the Uranus-Orius conjunction in Sagittarius. Dmitri Shostakovich (born Sept. 25, 1906, in St.Petersburg, Russian Federation) is regarded as one of the great composers of the 20th century. He achieved fame during the Soviet period, but had a complex relationship with the government. It is not quite certain to what extent Shostakovich expressed his opposition to the state in his music, but it has been claimed, that many of the composer’s works contained coded anti-government messages. His Sun-Orius conjunction is in Libra. James Dean, the iconic young rebel (born Feb. 8, 1931, in Marion, Indiana) has a triple conjunction of the Sun, Damocles and Orius in Aquarius. 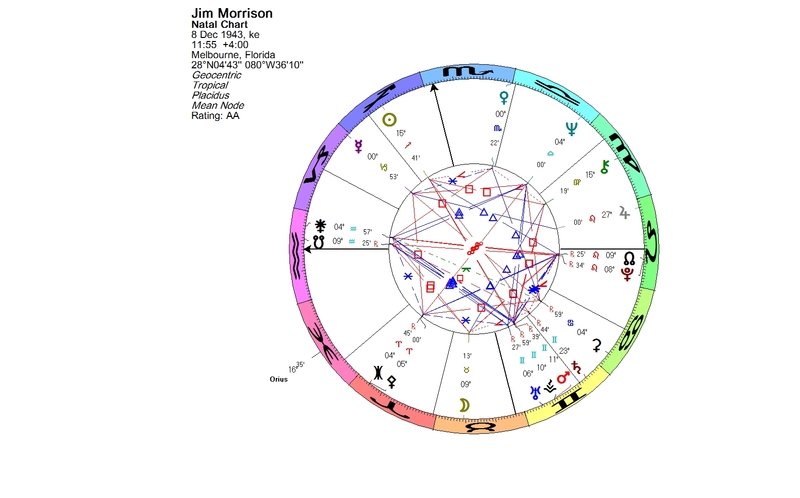 Jim Morrison (born Dec. 8, 1943, in Melbourne, Florida), the anarchistic front man of the Doors, has a tight Sun-Orius square in his chart. Garry Kasparov (born April 13, 1963, in Baku, Azerbaijan) is a Russian chess grandmaster. After his retirement from chess in 2005, Kasparov turned to politics and created the United Civil Front, a social movement whose main goal is to “work to preserve electoral democracy in Russia”. He is an outspoken critic of Vladimir Putin. 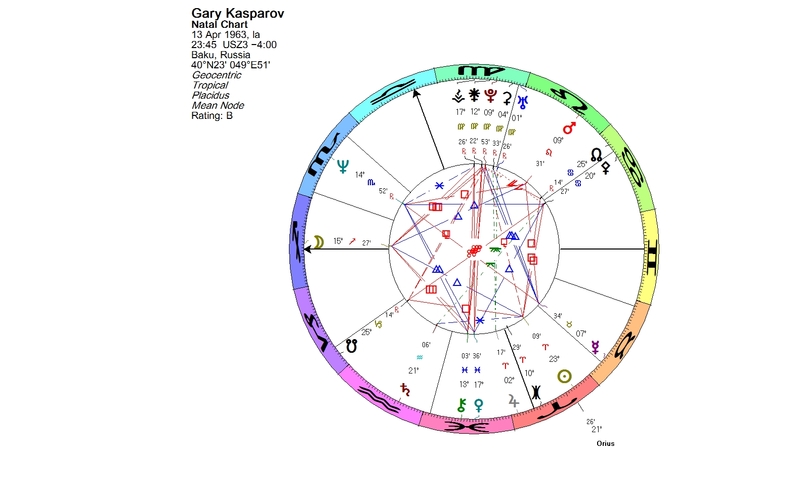 Kasparov has a triple conjunction of the Sun, Orius and Typhon in Aries. 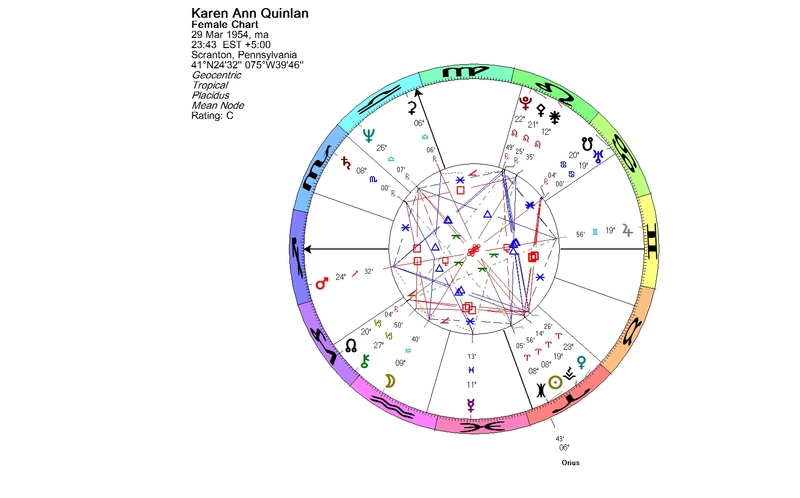 Karen Ann Quinlan (born March 29, 1954, in Scranton, Pennsylvania) was an American coma victim who became an important figure in the history of the right to die controversy in the United States. She was kept alive for years on a respirator, until her parents won a landmark case to have equipment removed. She had a triple conjunction of the Sun, Eris and Orius in Aries. 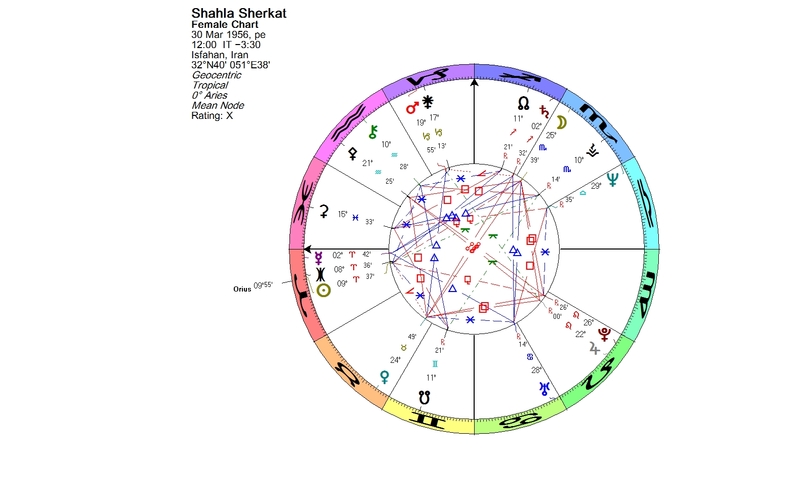 Shahla Sherkat (born March 30, 1956, in Isfahan, Iran) has also a triple conjunction of the Sun, Eris and Orius in Aries. She is a feminist journalist, one of the pioneers of Women’s rights movement in Iran. 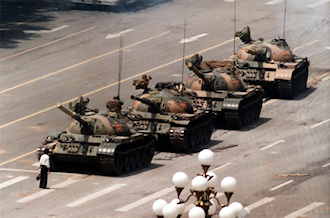 ”Tank Man”, an unknown Chinese protestor, stands in front of military tanks on June 5, 1989, the morning after the Chinese military had suppressed the Tiananmen Square protests of 1989 by force. There was a quadruple conjunction of the Sun, Jupiter, Orius and Pholus in Gemini. This photo was taken on June 5, 1989, by Jeff Widener (The Associated Press). 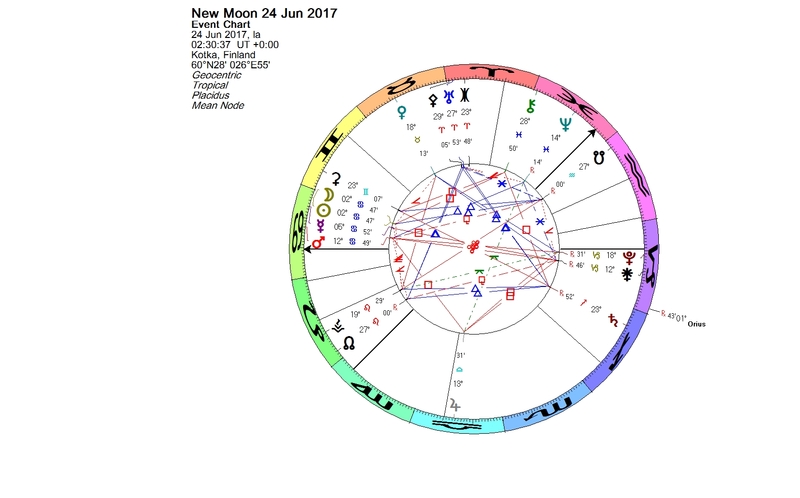 The Full Moon at 18+ degrees of Sagittarius has brought us a phase of faith and optimism. The Moon is in tight conjunction to Varda, Lady of the Stars, whose face radiates light. 174567 Varda is a trans-Neptunian object named after principal goddess of the elves in J.R.R. Tolkien’s fictional mythology. Varda created the stars and constellations, and also set the vessels of the Sun and Moon upon their courses. In light is her power and her joy. “Of all the Great Ones who dwell in this world the Elves hold Varda most in reverence and love. Elbereth they name her, and they call upon her name out of the shadows of Middle-earth, and uplift it in song at the rising of the stars,” writes Tolkien. 174567 Varda is highly likely to be a dwarf planet. Dr. Mike Brown has ranked it as the 15th largest object on his dwarf planet list. The orbital period of Varda is around 310 years. It is usually classified as a cubewano, a classical Kuiper belt object. Minor planets in this group do not cross Neptune’s orbit, and they are not controlled by an orbital resonance with Neptune. However, the boundary between the classical objects and the so called scattered disk objects is blurred, and there is no official definition of a cubewano. According to the Deep Ecliptic Survey’s (a project to find Kuiper belt objects) classification Varda has been referred as a detached object. 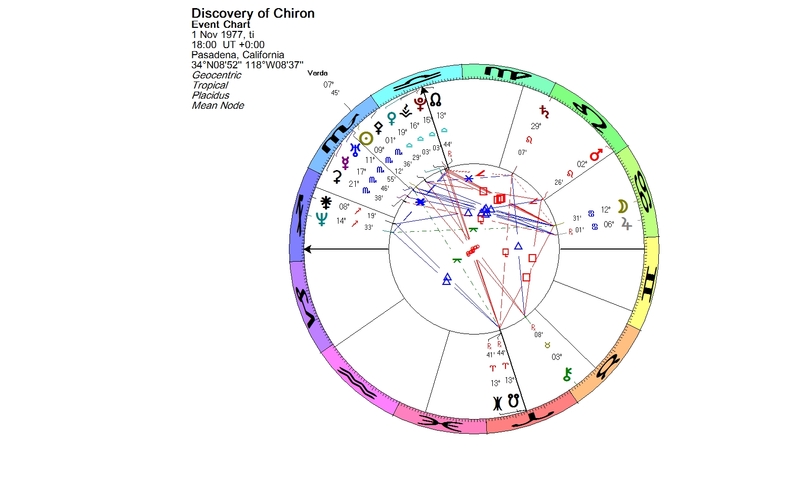 When I was doing my research for this Full Moon in order to find good examples on Varda, one event rose above the others, namely the discovery of Chiron. Chiron was discovered on Nov.1, 1977, by Charles T. Kowal from images taken on Oct. 18, 1977. It was named after the wise centaur Chiron in Greek mythology. 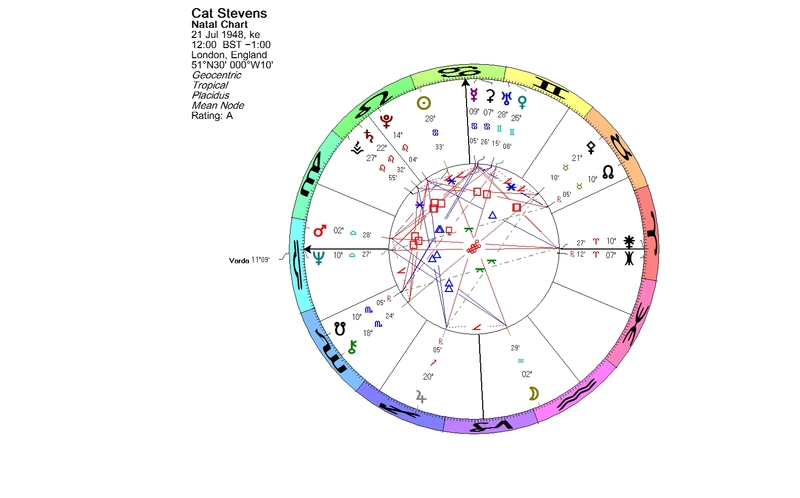 In the discovery chart for Nov. 1, 1977, the Sun in Scorpio is in conjunction with Uranus and couple of minor planets, one of which is Varda. Varda’s prominent position in this chart fits so well with Chiron’s tendency to raise awareness. It is difficult to see in the dark. We need light in order to become aware of something. 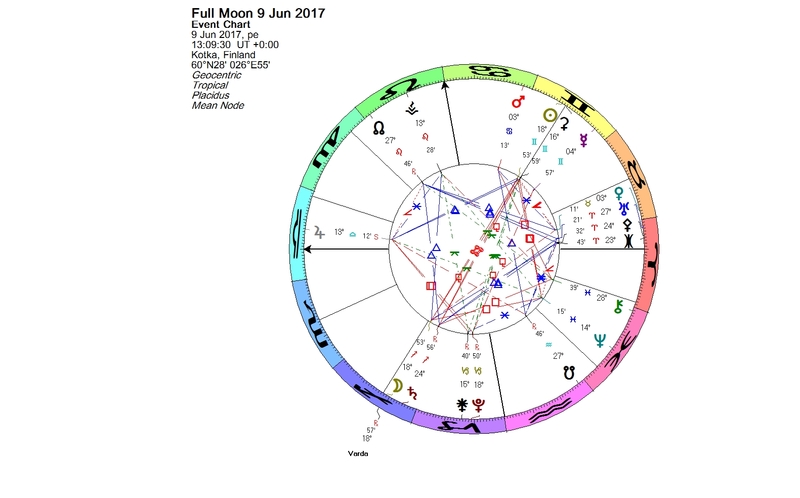 You are currently browsing the Lunations by Kirsti Melto weblog archives for June, 2017.